The head of the city of L.A.’s public housing agency is in hot water after evicting nine tenants in retaliation for their participation in a protest on his front lawn — in Rancho Cucamonga. The L.A. Times story on the dispute includes a photo taken by housing chief Rudolf Montiel through his RC window of the mob on his lawn. Nice to see the Times publish a photo from Rancho Cucamonga, even if it was shot by a city bureaucrat. Oh, and you have to love the quote by L.A. Councilwoman Janice Hahn, reacting to the assertion by Montiel (who is paid $400,000 a year) that his family was virtually imprisoned in their home while the protest went on. I guess that qualifies as a compliment to the RC lifestyle. Claremont is home to four Middle Eastern restaurants, with Casablanca, Saca’s, Darvish and its next-door neighbor, Ali Baba. 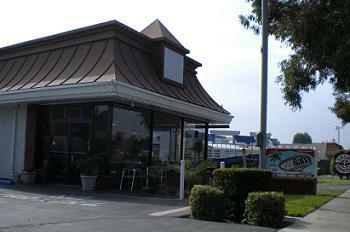 Ali Baba took over the former KFC on Foothill near Towne about a year ago. A Korean place and I think another eatery were in the KFC in the interim, but Ali Baba looks to be making a go of it. I’d meant to visit for a long time and finally did so on a recent staycation. Ali Baba’s dining room is small but well appointed with cherry-finished tables and chairs. They’ve done a nice job with the place. You order at your table. 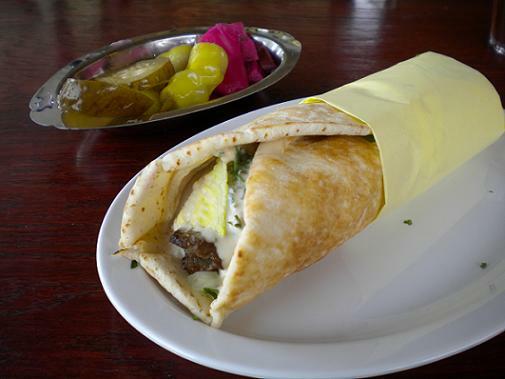 I had the kafta sandwich ($7.25), which is a ground beef mixture with onions, parsley and spices on pita bread with hummus, tomatoes and romaine. A dish of pickled peppers was also brought to the table. (No, it wasn’t a peck, nor did I pick it.) It was a tasty sandwich. If you’re pinching pennies, you could get basically the same sandwich at Aladdin Jr. for a couple of quarters less, but I was happy with the experience. The broad windows offer an excellent view of the street, as well as an X-ray vision type of look into the restaurant as you drive by. From the street, nothing is left to the imagination. Ali Baba is all about transparency. Watch a 5-minute video of the L.A. author and humorist in the kitchen, and see the recipe, here. Phoenix, by the way, will offer his “Retro Holiday Slide Show” in Pomona on Dec. 11 at the NHRA Museum. Details here. Did you attend Friday’s concert at Citizens Business Bank Arena by Elton John and Leon Russell? If so, what did you think? I was there and thought it was great — and at 3 hours, 15 minutes, it was value for the dollar, too. My column Wednesday has an account of the show. For the set list, click on the “continue reading” line below. ‘Trust’ me, I want to be a politician! A Rancho Cucamonga City Council candidate lost at least one vote due to dubious punctuation in her campaign signs, which made her seem to be questioning her own trustworthiness (perhaps getting the jump on cynical voters disinclined to trust any politician). “I was wary of someone who’d want me to ‘trust’ them in government. Just what does quote-unquote ‘trust’ mean?” reader Will Plunkett wonders. The “Other Sites of Interest” section over on the right side of this page has been updated. Even its name has changed; it used to be “Other Blogs of Interest.” Let me run down the differences. Two inactive blogs have been dropped: IE Food and Restaurant Reviews and the Goddess of Pomona. The former has posted only once this year. Gong! And the Goddess appears to have retired her page. If someone wants “www.goddessofpomona.com,” the domain name would seem to be available. While I was tinkering under the hood of my blog, I added three sites to the list, one of which isn’t a blog (which is why the label changed). They are the online version of the Chino Champion newspaper, the La Verne Online website and the Claremont Courier’s City Beat blog. I’d have added the Courier itself but its content is only available to subscribers, so its blog is the next-best thing. We have what I think is a nice lineup of 11 non-Bulletin sites for your reading pleasure: the cream of the crop of local blogs, two dining blogs that often feature Inland Valley restaurants and LA Observed, which offers a daily roundup of Southland news and opinion. I visit these sites daily. Steve Harvey’s Only in LA blog isn’t updated often but I’m keeping it here anyway, out of loyalty. 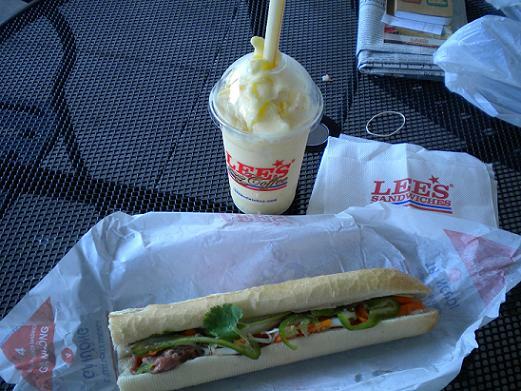 Lee’s is a San Jose-based chain specializing in banh mi, which are Vietnamese sandwiches. 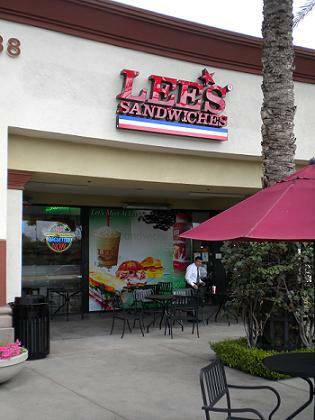 A Lee’s opened a few months ago in Chino, of all places, its first Inland Valley incursion. The shop is in the food court of the sprawling Chino Spectrum Marketplace shopping center on the north side of Grand. I only knew Lee’s by its excellent reputation. I checked it out for a recent lunch. They have Asian and American sandwiches on 10-inch baguettes and European sandwiches on croissants. (Remember the French influence in Vietnam.) 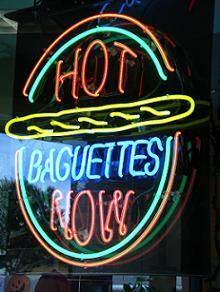 A neon sign in the window announces “Hot Baguettes Now,” akin to Krispy Kreme’s donuts sign. I had the grilled pork banh mi, which comes on fresh-baked bread with pickled daikon and carrot, onion, jalapenos, cilantro and mayo. The price was an absurd $2.79. The mango smoothie I got to wash it down was $2.95, also a good deal. There’s only a four-seat counter inside for dining in, but a large patio sufficed on a comfortable day. The sandwich was excellent, especially notable for the bread, and was filling, and the drink was good too. Banh mi can be found at some Vietnamese restaurants locally, and I know of one banh mi shop, Super Sandwiches in Montclair. If there were a Lee’s closer to our Ontario office, I would eat there all the time. Pomona is Everywhere, a continuing series: Reading a piece on Supervisor Zev Yaroslavsky’s website (via LA Observed) about the pending rehab of L.A. County’s long-abandoned 1925 Hall of Justice at Temple and Spring in downtown L.A., I learned that the project manager, architect Alicia Ramos, is a Cal Poly Pomona grad. 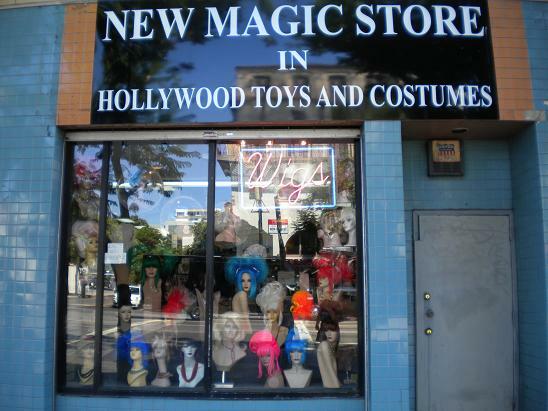 I’ve always wondered why, traditionally, wig shops are concentrated on Hollywood Boulevard, always with bewigged rows of foam heads in the window, such as in the photo above. 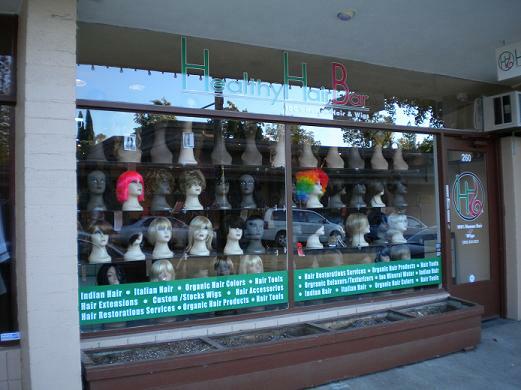 Then, disconcertingly, a wig shop opened a few weeks ago on Bonita and Yale avenues in Claremont, seen below. It’s just east of the ice cream shop. A question I never thought I’d ask: Is Claremont the new Hollywood? Well, it’s all over except for the sobbing (or cheering). San Bernardino County results can be seen here. Some highlights: In Rancho Cucamonga, Dennis Michael is the new mayor, while incumbent Diane Williams was elected and former mayor Bill Alexander made a successful comeback as a councilman. Chino, Chino Hills, Ontario and Montclair’s councils were re-elected, while in Upland, Tom Thomas was ousted in favor of Gino Filippi, while Ray Musser and Brendan Brandt were re-elected. And Janice Rutherford unseated Paul Biane from the Board of Supervisors. L.A. County results can be viewed for city races here and for school races here. In Pomona, Cristina Carrizosa and Freddie Rodriguez cruised to re-election, while Tim Saunders lost narrowly to Ginna Escobar. The utility tax increase failed spectacularly while the school bond failed unspectacularly, unlike Claremont’s school bond, which went down in flames.